This article is 3319 days old. 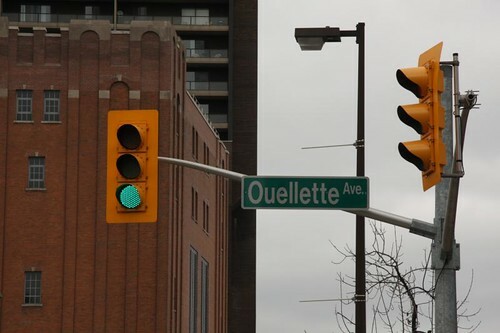 Ouellette, just one of many French surnames/street names found in Windsor. 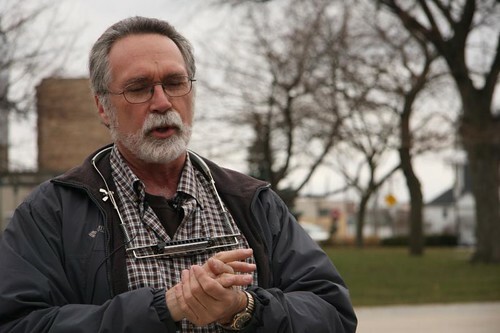 In the third installment of Broken City Lab‘s “Save The City” campaign, Windsorites took to the streets with University of Sudbury folklore Professor Marcel Bénéteau for an insightful, albeit chilly, history lesson. The crowd of about 30 gathered in front of the Capitol Theatre Saturday afternoon, and shortly after 3pm we headed east to the corner of Ouellette and University. That’s Ouellette, not Ooolette, or Ohlette. Ouellette? Oui. Ouellette. Oui? The mispronunciation of some of our French street names was only part of what inspired Broken City Lab to host this guided walking tour. The history of our city is chock full of French names. In fact, if it weren’t for the French explorer Antoine de la Mothe Cadillac, and the French regime’s desire to keep the British out of the continent’s interior, our history would be much more anglicized. It’s the awareness of this fact that Michelle Souilliere and the BCL crew want to bolster. A good crowd came out for the third installation of Broken City Lab's "Save The City". The tour began with a little background information on why our downtown is where it is. Windsor sprouted up because of a land deal gone awry. Vital Ouellette, who owned the strip of land near where the avenue runs now, stood his ground when asked to sell his property to the Great Western Railway in 1854. This forced the railway to build the terminus where modern-day Riverside and Ouellette meet. Throw in a ferry dock a couple of blocks west (you guessed it, at the foot of Ferry Street), and the downtown core was born. The walking tour then took us to the corner of Goyeau and Chatham, where we ducked for cover from the winds in the parking garage entrance. Goyeau is named for a Detroiter named Jean Baptiste Goyau, who agreed to live on the “south shore” and care for the crops and livestock belonging to the Huron mission. Both Jean Baptiste and his wife played a large role in the day to day operations of the mission farm. Marcel Bénéteau speaks of the various French street names and their orignating families. We continued on, skipping over MacDougall, Glengarry and Aylmer, and ended up at Louis Avenue. I’ve heard that an Ottawa burial ground was situated around Louis and Riverside, but Bénéteau couldn’t confirm that. We decided to turn around there, but not before Bénéteau mentioned some of the other significant French streetnames- Marentette, Langlois, Parent, Lesperance, Villaire, and St. Louis (just to name a few). All these families made up Windsor’s pioneering community, with narrow farms spanning from the river to Tecumseh Road. Marcel Beneteau and Co. belt out some French tunes. We headed west again, and ended up at the corner of University and Aylmer for the musical portion of the tour. Justin Langlois, ACWR Executive Director and Broken City Lab director, handed out some rudimentary but effective instruments. 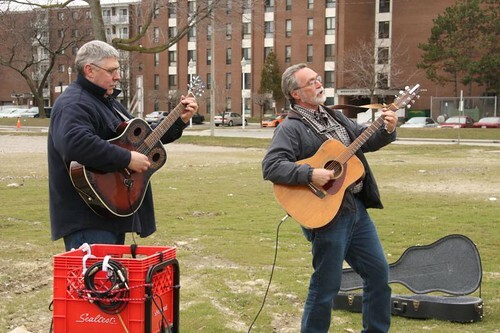 Marcel Bénéteau and his accompaniment (professional, as well as the audience on tambourines and recorders), serenaded us with French Canadian folk songs that were sung by the men, women and children in this area 300 years ago. Songs that migrated from France with the first explorers and were passed down through the generations of French families in this area. Here’s a video of Marcel Bénéteau singing the song Les filles de sandwich. The fourth part of the “Save The City” series is called “Things Worth Saving”. It will take place in April sometime, so check the BCL blog regularly for more details.